When I started this blog, I said I’d jump in and let you know what is going on with this nerdy chick (a.k.a. me) every now and then. Well, I’ve been doing a lot of interviews. I try to post all of those on my Facebook author page. Click HERE to view. Book promotion involves more time than I ever imagined. But it feels like things are going well, so I’ll keep on, keeping on. My biggest news for the time being is that Greek rights to The Boy Project were sold by my wonderful agent to Psichogios Editions. This is the same Greek publisher who publishes Diary of a Wimpy Kid, so I am very excited. Click here: I AM A READER NOT A WRITER for details! Over at KRAZY BOOK LADY there is another chance to win a hardback copy of The Boy Project. It also includes a book review and a guest post by me! Contest ends Feb. 25. Check it out HERE. YABOOKSCENTRAL is offering a chance to win book bling from The Boy Project, and other debut novels, and some advanced reading copies of forthcoming books too! This contest ends March 1, 2012. So if you have a tween/teen reader in your household, or you are a tween/teen reader or you’re a teacher and librarian who has students who would like these, or if you just want them…. all you have to do is be one of the first 7 people to comment below and I will mail the friend pack to you. Couldn’t be easier! Contest open to US, Canada, and Europe. One per household please! I hope to have more interesting things to share with you soon. Thanks for reading! I feel really lucky to have been able to interview so many great nerdy chicks! 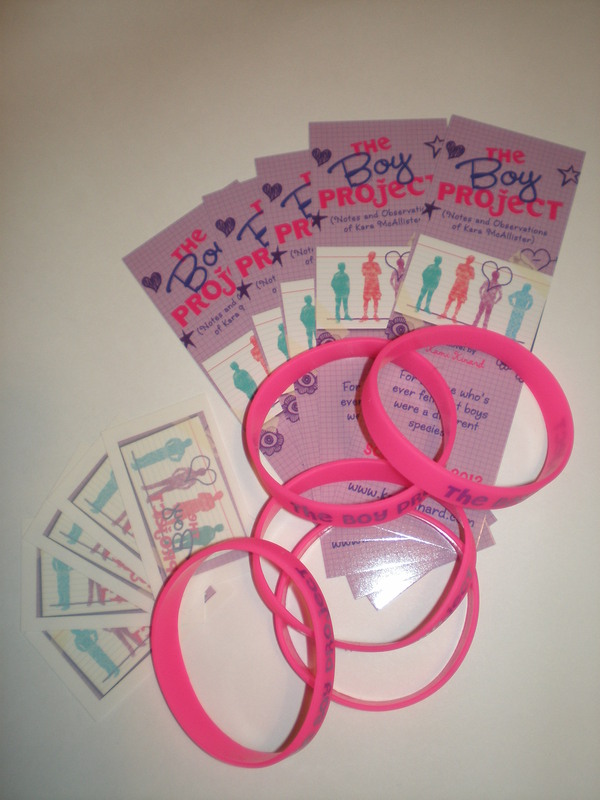 This entry was posted in Contests and Giveaways, This Nerdy Chick and tagged giveaway, THE BOY PROJECT, THE BOY PROJECT giveaway, Win free books, Win the Boy Project. My daugher read your book and loved it! Nancy Kennedy told us about it and she has it on her Kindle. She’s in the 5th grade and truly enjoyed it! So glad she liked it! And good to hear Nancy is spreading the word! I would be eternally grateful if I were to get one of those packets! My younger sister would love me forever! Oh, and my email is kitkat777(at)mail(dot)com. Sorry about that. Can’t believe no one has commented can’t believe I”M commenting I’m 15 for Christ’s sake. o well.. TELL YOUR SON LAUREN ELIZABETH SAYS HI!!!!!!!!!!!!!!!!! I gave the book to my 12 year old niece for Christmas. She read it and enjoyed it and is currently working on a book report about it for her English class at school. She was really excited when she saw it for sale at her school’s Scholastic Book Fair and told her English teacher that she had already read it (and that her aunt knew the author.) She would love some bling! My girls both loved the book – and the bracelets – way too much to share them!!!! I know some friends who would love to have some too! Kami – I’ve been trying to post this for 2 hours while traveling home from Bri’s basketball game in Sumter!!! My iPad just wouldn’t do it!! LOL! Girls…do I know about girls, or what??? LOL! Hope to see you soon!! wow my sister would really love some swag, especially the tattoos : ) and to be honest i wouldn’t mind one of those bracelets either! Thank you everyone who commented. I will need your addresses to mail you the loot. You can email them to me at kamikinard AT juno DOT com. Also, I will try to send you all an email. Kristy, sorry it took you so long to get through. Pebbles, please tell your niece she can feel free to ask me questions via email for her book report if she wants (she may have a format that won’t allow this). Lauren, J says hi back! Your blog is a lot of cute fun. Well, being nerdy isn’t the stigma it used to be. Thank goodness for enlightenment! So of course you can be a chick and nerdy! Thanks for the compliment! Thanks Margie. You are the 9th person, so you’ll have to try again! Thanks for commenting though, and I will run something like this again either here or on my FB page or both places! darn! tenth one to reply! well she better hold another contest like this! Yes, I’ll do another contest soon Vanessa! Okay ladies, just letting you know that I have all of the addresses, have printed all of the address labels and stuffed the envelopes. Your loot will go into the mail tomorrow! In the meantime, check out the newest giveaway in today’s post… Audrey Vernick’s So You Want to be a Rock Star picture book, book tote and more!